Dr. Vikas Saxena, the Official Student Representative has now been promoted to the post of Deputy Dean, Department for Foreign Students. Indian medical students studying MBBS at Perm State Medical University can now feel even more proud and expect an upgrade in the facilities offered to them. The students now have one more reason to be happy as they can offer more insights and suggestions to someone like Dr. Vikas, who has been playing a pivotal role in procuring best student facilities at the University. For the Indian students in the university, the saying THE BEST IS YET TO COME fits perfectly as they will now be able to offer more contribution and share greater responsibilities for the overall growth of the University standards. Dr. Vikas Saxena took over the responsibilities of the position on 2nd of October 2018 at Perm State Medical University and addressed all the foreign students to expect a much better stay and services in the university in his speech. 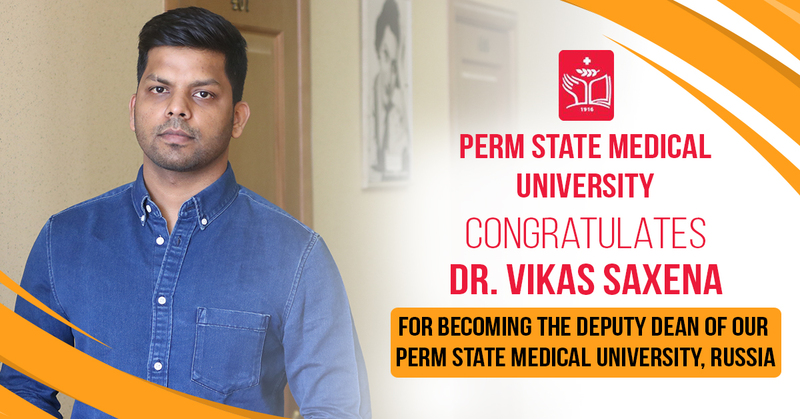 The Perm State Medical University hereby congratulates Dr. Vikas Saxena on his growth in the organization and becoming an integral part of the University Management. The University is further willing to enhance the support to enable him and extend best of services to the Foreign Students in the University. Perm State Medical University was founded on 14 October 1916. It is situated in the city of Perm, Perm Krai, Russia. Now Perm State Medical University is a recognized scientific center of higher medical education and research work.